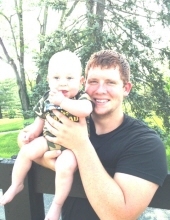 Blake Emerson Colson, age 21, of the Bagdad, died Monday, March 4, 2019. He was born September 6, 1997 in LaGrange, and was a Truck Driver for Colson Family Logistics. He is survived by his wife: Samantha Kay Young of Bagdad; one son: Aiden Layne Colson of Bagdad; one daughter: Avery Lee Colson of Bagdad; his father: Rommel Colson (Kelley) of Louisville; his mother: Johnna Amos of Bethlehem; paternal grandfather: Calvin Colson of Winter Haven, Florida; maternal grandparents: John and Mary Welch of Bethlehem; three brothers: Derek Colson (Elizabeth) of Haines City, Florida, Christopher McCarthy (Kylie) of Louisville, and Zachary McCarthy (Christie) of Campbellsburg; three sisters: Morgan McClain (Jeremy) of Eminence, Rebecca Louden (Josh) of Pendleton, and Makenzie Hardin (Ethan) of Shelbyville; and several nieces and nephews. A celebration of his life will be held 2 p.m. Saturday, March 9, 2019 at Bagdad Baptist Church. Rev. Steve Adams will officiate. Expressions of sympathy to assist with funeral expenses may be made in the form of contributions to Sholar Funeral Home, 5710 Castle Highway, Pleasureville, KY 40057. To send flowers or a remembrance gift to the family of BLAKE EMERSON COLSON, please visit our Tribute Store. "Email Address" would like to share the life celebration of BLAKE EMERSON COLSON. Click on the "link" to go to share a favorite memory or leave a condolence message for the family.